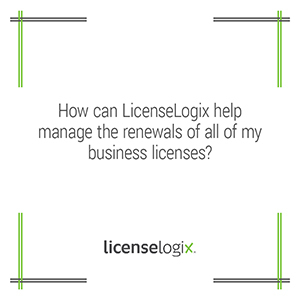 How can LicenseLogix help manage the renewals of all of my business licenses? Our License Management System (LMS) will notify your LicenseLogix account manager and the contact that you designate within your entity of all upcoming renewals well in advance. We will also file for the renewal of the license and ensure that all supporting documents are updated and included with the renewal application. If you prefer to handle your own renewals, sign up for our Renewal Confirmation service to have our expert staff follow up with lethargic licensing divisions to make sure your licenses are renewed quickly and correctly.